I have many fond memories of Indian feasts growing up in the UK. And it’s these memories (and the end of the mango season) that inspired this, my 100th blog post……. In most British towns curry loving parents introduce their children to the local Indian restaurant or take-away at a relatively young age. Many of these children, like me, grow up with a lifelong love for Indian food. Don’t believe me? Well ask a Brit their favourite Indian dish and chances are they will passionately talk about dishes like chicken tikka masala, garlic naan, vindaloo, onion bhajis, samosas and more. Most would also mention that the best Indian feasts start with poppadoms and pickles. When it comes to Indian pickles the easy option is to buy something in a jar from the supermarket. But nothing beats the enjoyment and satisfaction that comes from making your own pickles. 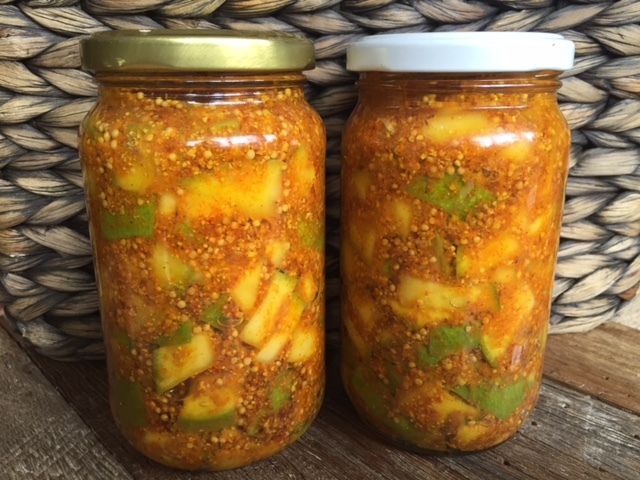 So, with the mango season coming to an end I decided to move quickly to whip up a jar of mango pickle that would last through Autumn. Armed with three small mangoes I found myself faced with many recipes online for pickling mangoes. I quickly landed on this Gujarati recipe as a tribute to my husband’s family who originally moved from Gujarat to the UK in the 1970s. This recipe is so good – there isn’t even any cooking involved. Although the original recipe was described as ‘medium’ spiciness I thought it was heavy on spice for the average palate. I decided to experiment to see if I could go a little lighter on the spice without losing the distinctly Indian flavour. It worked. But If you want it closer to the original then add a little more fenugreek, chilli and turmeric. 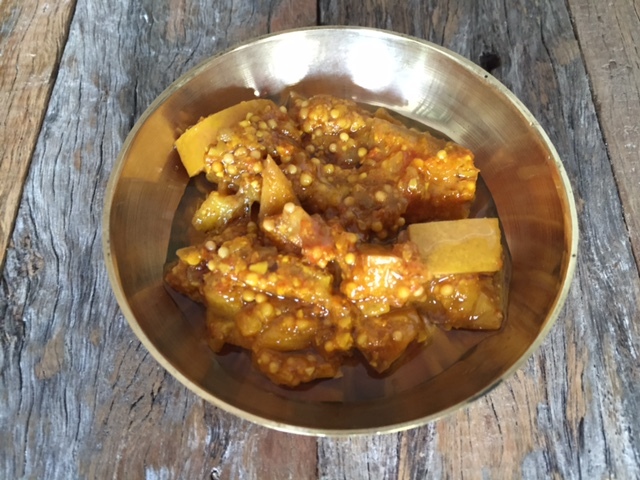 Note – the traditional method is to use unripe (green) mangoes that give the pickle a sour flavour. If you can get them great, but if not mangoes that have started to ripen still work (I have tried both options). Wash the mangoes with water and dry the skin. 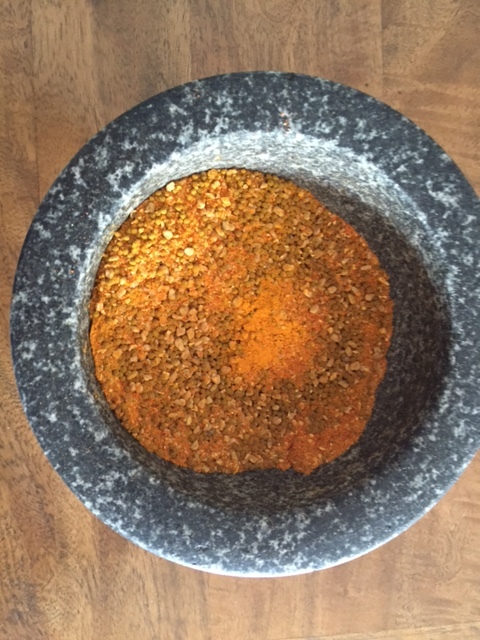 Grind the fenugreek seeds in a space grinder until they split – you are looking for a course mixture rather than a fine powder. Slice the mango flesh into small even sized cubes and add the cubes to a large bowl. Add the ground fenugreek seeds and mustard seeds to the bowl, followed by the turmeric, chilli powder, asafoetida and salt. Mix everything thoroughly so that the mango flesh is evenly covered in spices. Transfer the mixture to a sterilised jar and pour over the oil (ensure the mango is well covered). Store the jar in a dark cupboard for one to two weeks (after which it keeps for a year). Serve as a dip with poppadoms, naan and parathas, and alongside rice, curries or dahl. After each serving ensure that the oil covers the mango to keep it well preserved. 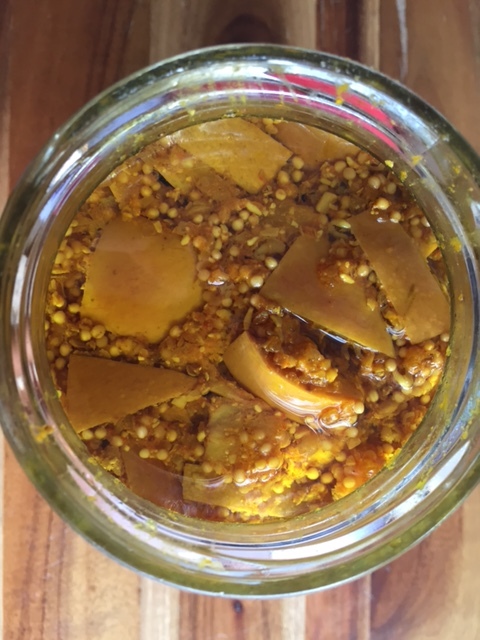 Tags: authentic, chutney, Indian, mango, pickle, recipe. Bookmark the permalink. Thanks Elaine – can’t believe I am 100 posts in already! 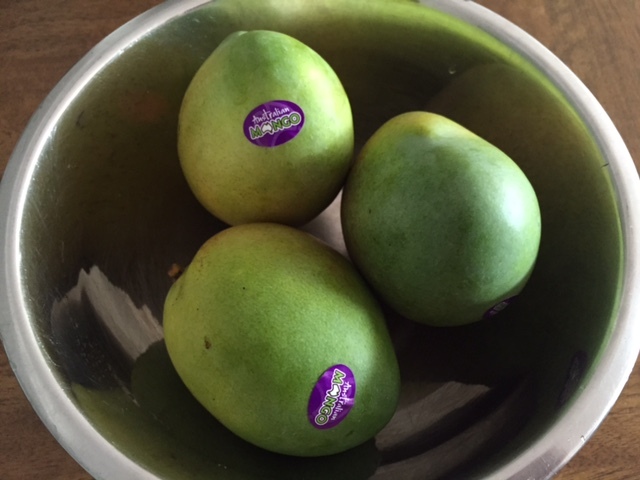 Wow – an Italian/Brit/Indian like me – I don’t know how common mangoes are in Italy but give this a go!